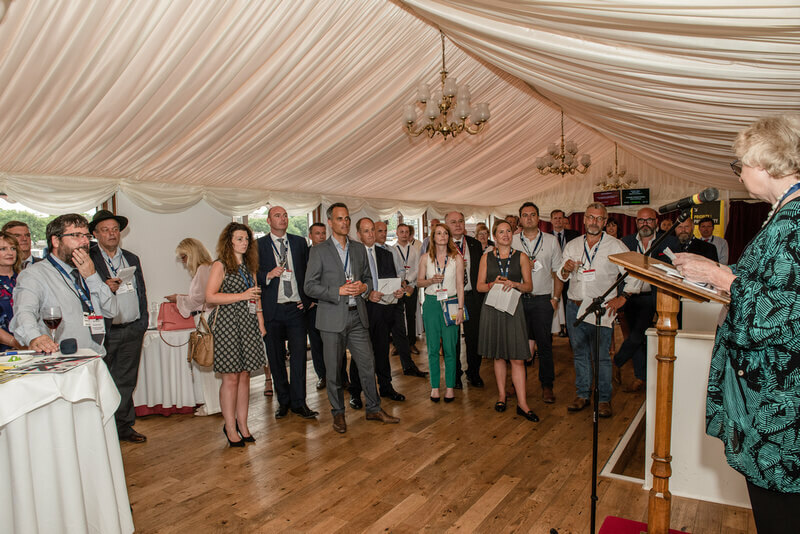 Winners of the 2018 Print Futures Awards for people aged 18 to 30 years were presented with their Awards at an event at the House of Lords on 26 July kindly hosted by Lord Black of Brentwood, Deputy Chairman of the Telegraph Media Group and President Emeritus of The Printing Charity. Presenting the Awards, Lord Black said: “This evening is always a cause for celebration and this year’s Print Futures Awards are more successful than ever. It is the largest single awards event for young people and this year there were 302 applicants of extremely high calibre and 91 winners. Applications came from across the UK, covering a whole range of disciplines. Lord Black also paid tribute to Baroness Dean of Thornton-le-Fylde, who died earlier this year. She was an icon of the printing industry, a huge supporter of The Printing Charity, a champion of young people, and hosted the Print Futures Awards event for many years. Neil Lovell, The Printing Charity’s Chief Executive, said: “People in the sector are always talking about needing to bring in new talent and showing how diverse it is and these Awards help to support that call for action. These 91 young people from every area of the sector are a really great sign. They show more young people have clear plans to enter the sector while those already in the sector, including apprentices, see a positive future and are passionate about progressing within it. There is obviously more to do in making the sector attractive to young people, which is why we want more of the sector involved in future. This year’s winners are: Lilly Adcock, Hannah Allsworth, Laura Andrew, Euphrosyne Andrews, Katie Angus, Sophie Atkinson, Ayo Awokoya, Matthew Barber, Tom Barlow Brown, Finola Billings, Tom Bonnington, Matthew Britton, Samuel Brooke, Sophie Bruce, Fiona Buchanan, Charlie Cahill, Carola Cappellari, Georgie Carter, Sophie Chater, Soofiya Chaudry, Sophie Christian, Emily Clarke, Maxime Cossé, Ava Doran, Tessa Duell, Joanna Fuller, Lisa Galbraith, Sebastian Garraway, Amy Gear, Billy Gibbs-O’Riordan, Louise Gill, Rachael Grant, Claudia Greco, Eve Hawksworth, Georgia Heath, Charley Henly, Rose Henry, Daisy Holder, William Horsnell, Ellie Howard, Amy Irvine, Chloe Johnson, Isobel Johnson, Daniel Jones, Laura Jones, Lauren Kent, Ayden Kirk, Nathaniel Kunitsky, Heiba Lamara, Richard Lemmer, Josh Levett-Thomas, Andrew Lindsay, Thomas Lockey, Heather McDaid, Leah McDowell, Tara McEvoy, Jennifer Miller, Matthew Moody, Ryan Munro, Isobel Nettleton, Marcin Nowak, Renuka Odedra, Sarah Olley, Tom Orde, Khadija Osman, Jessica Owen, Rebecca Parkinson, Clelia Petracca, Kate Plummer, Lauren Powell, Gemma Purkiss, Francesca Pymm, Louis Reynolds, Emily Ridge, Otis Robinson, Hollyanne Schnieden, Baldassare Sciacca, Sophie Scott-Foss, Natalie Shaw, Danielle Shepherd, Emma Skinner, Arica Smith, Nadine Smoczynski, Jessie Sullivan, Rosanna Sutcliffe, Megan Thomas, Lucy Twist, Victoria Walsh, Tom Walton, Jake Watson, and Amber Westley. Congratulations to the joint winners of this year’s Victor Watson Trophy, Sophia Djili and Agata Labedz, from De La Rue and KCS Print respectively. Alice Murray from BCQ Group was highly commended. 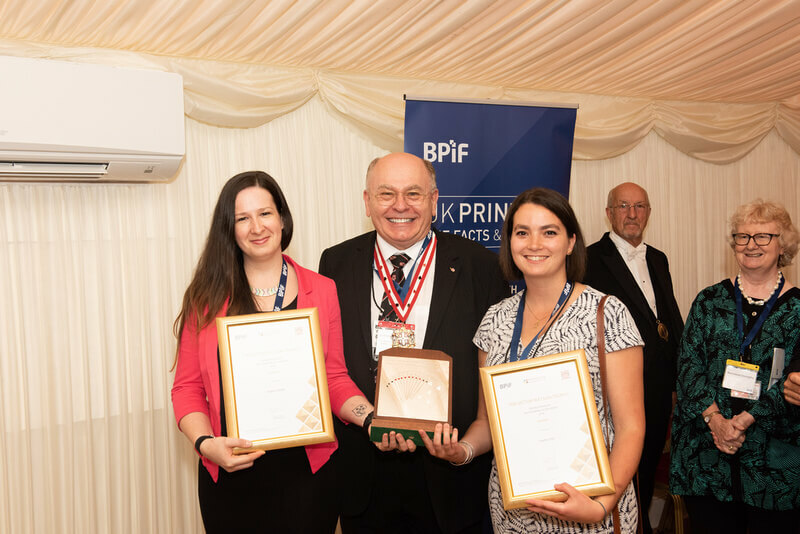 The trophy was presented on 4th July at the BPIF’s annual All-Party Parliamentary Print Group (APPPG) reception at the House of Lords. The Victor Watson Trophy, open to people aged 31 and under, was set up by the BPIF, The Printing Charity, and the Worshipful Company of Makers of Playing Cards, in memory of Victor Watson CBE DL, a legendary figure in print. He was a former Trustee and our President in 1992. The award recognises outstanding achievement by young people in the printing industry. Recipients are also eligible to apply for a Print Futures Award of up to £1,500.